Five days left in the final countdown of National Blog Posting Month, (Nablopomo). Cruising through the Brazos Valley of Texas on FM128 Madge was startled by a curious sign along the highway. She was hurrying back to Austin to catch a flight after attending an August graduation at Texas A & M in College Station. As she pulled off the road to take a snapshot, Madge found herself in a real dilemma. Should she go down this narrow country road to see what awaited and risk missing the plane or should she go straight on to Austin? Well dear readers, I’ll bet you know what happened next. Madge turned down that road, and after about 5 miles, came to a small community. As she slowly drove around she saw intriguing signs that this was not the same old small town story. 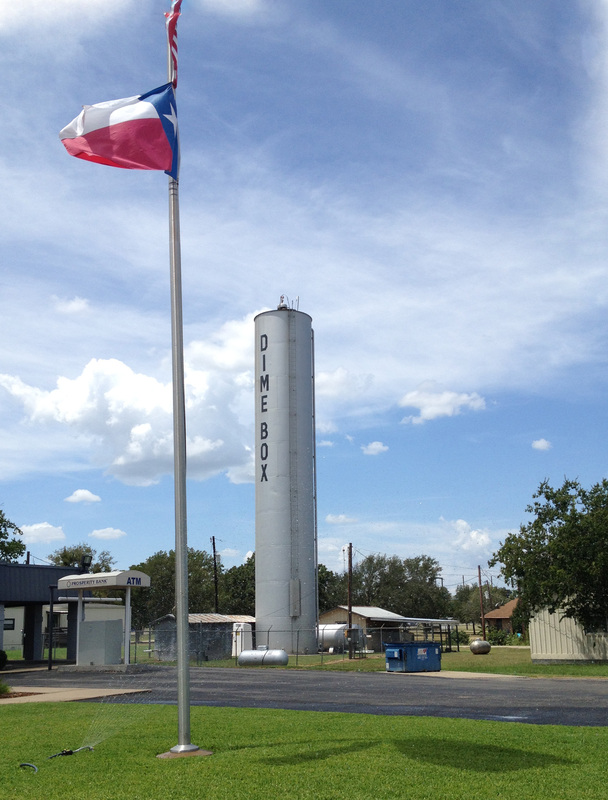 The tallest building in town was a cylindrical water tower marked Dime Box. 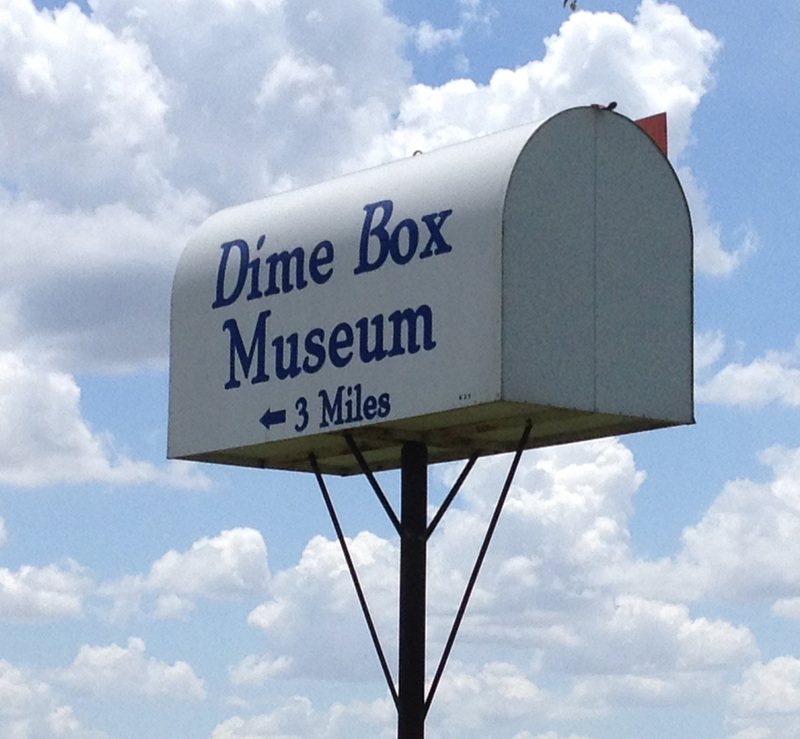 A small building sat at the base of it with a sign out front: Dime Box Heritage Society Museum. Madge walked in and Bonnie, the volunteer on duty, offered a tour of the museum once she turned on the lights. After all, as she put it, “there’s no point in having all the lights on if nobody’s here“. 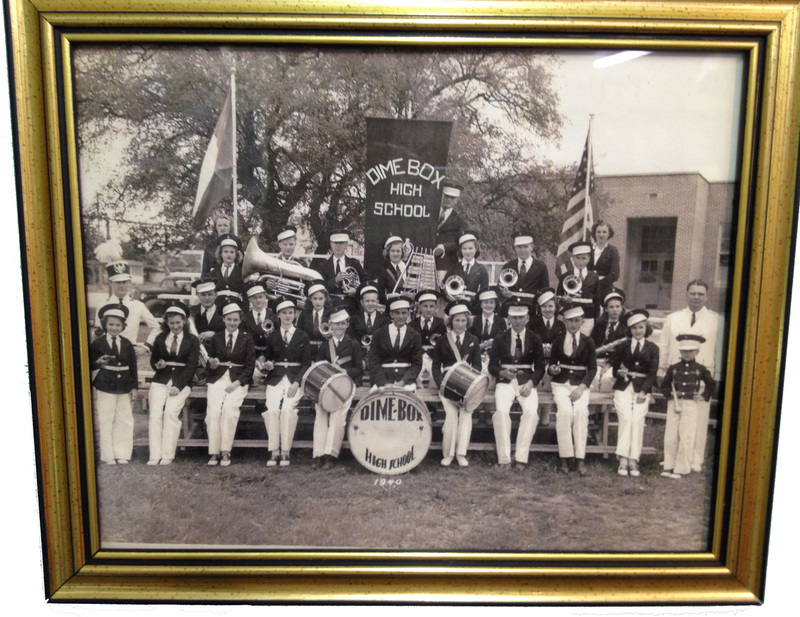 While we wait for the lights to warm up, here’s a little history. 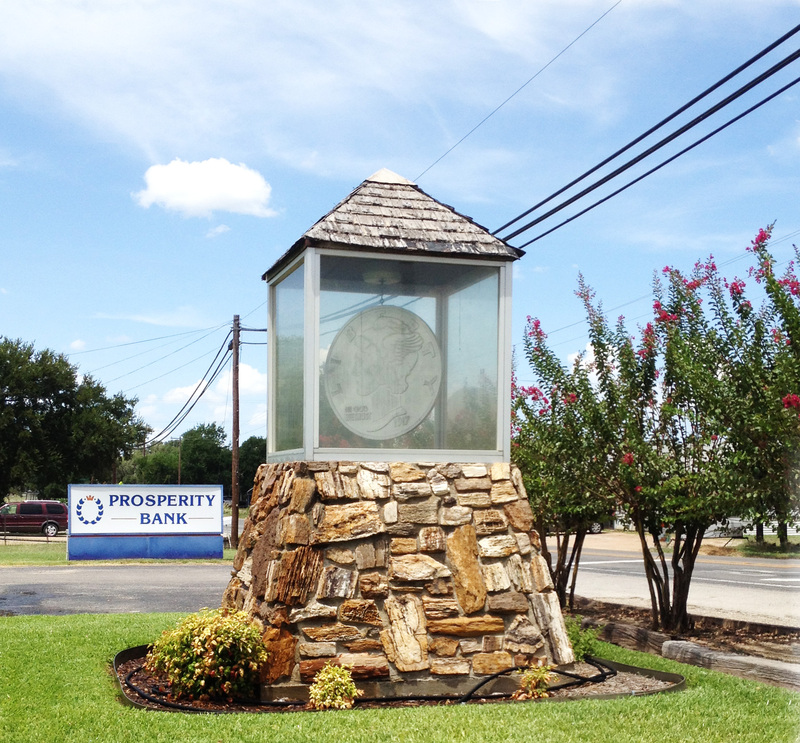 Dime Box, an unincorporated area in the heart of the Brazos Valley, was founded in 1869. Originally named Brown’s Mill for the local sawmill, the community didn’t have their own post office so residents would leave outgoing mail plus a dime for the postage in their mailboxes. Brown’s Mill ran into trouble when they opened their own post office in 1877. 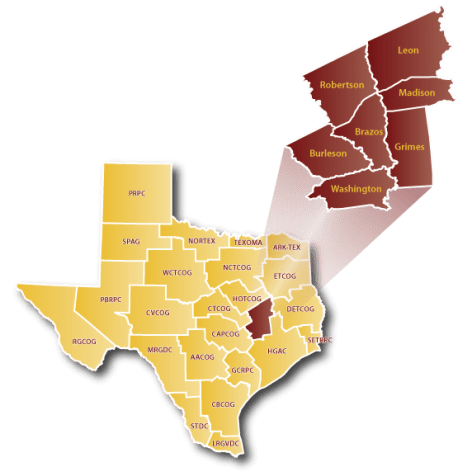 Their mail kept going to Brownsville so the United States Post Office required the community to change its name. The residents applied to change their post office name to Dime Box and mail was never misdirected again. Once the fluorescent lights were on, Bonnie opened the museum doors. 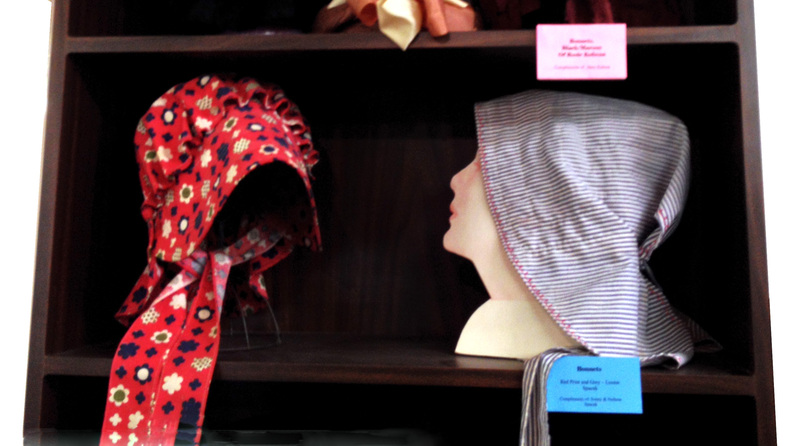 For a vintage lover like Madge, the museum was a little slice of heaven. Local residents had donated everything on display. Many of the names were Czechoslovakian, the roots of the original settlers. 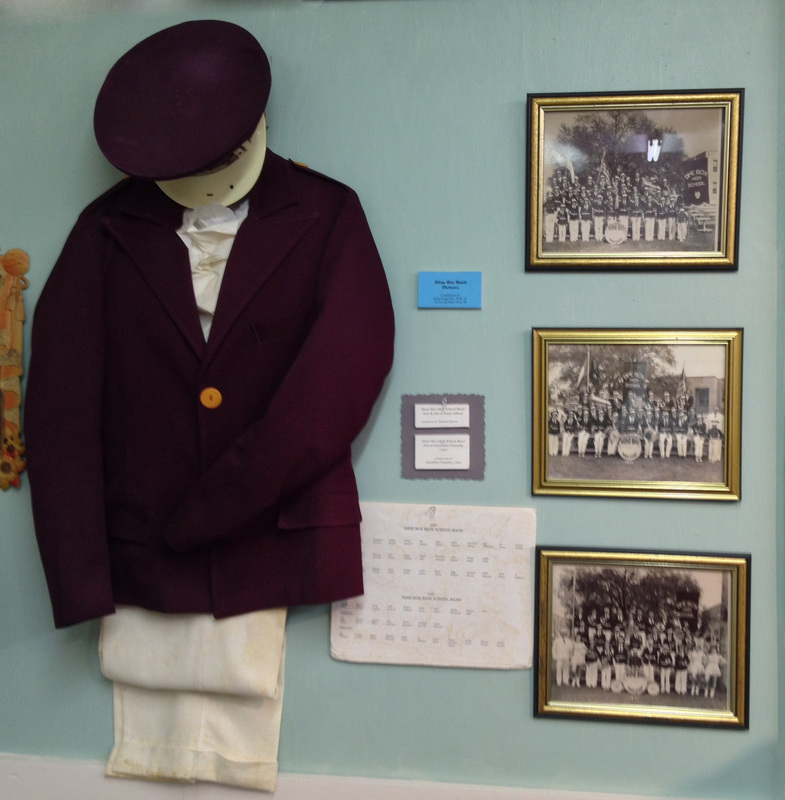 Madge was very impressed with the thought that had gone into the arrangement of the displays. 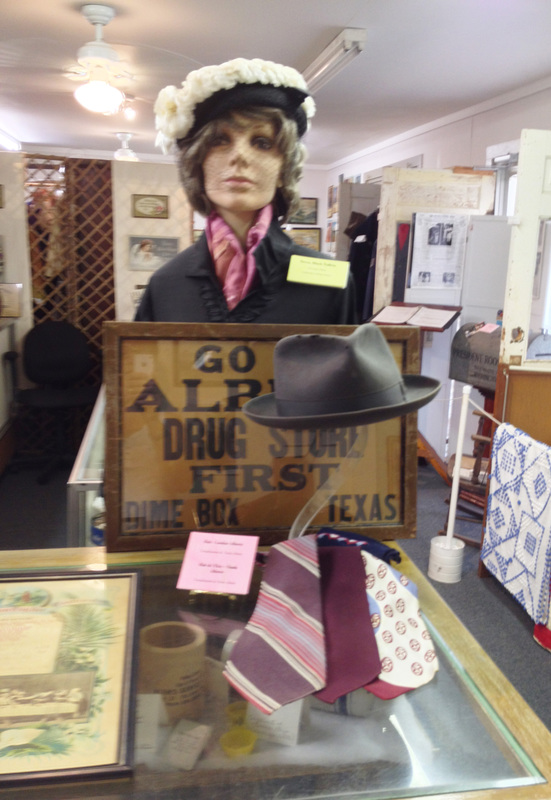 Items were carefully curated and labeled revealing the lives lived in that community during the last 100 plus years. 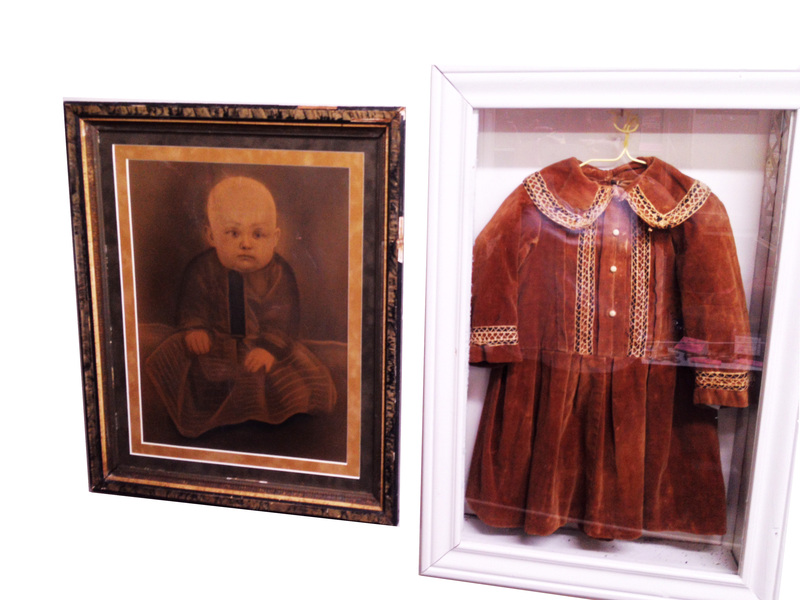 There was a beautiful framed oil painting from the late 1800s of an infant and along side it was the actual gown he wore in the portrait. A wonderful local band montage. 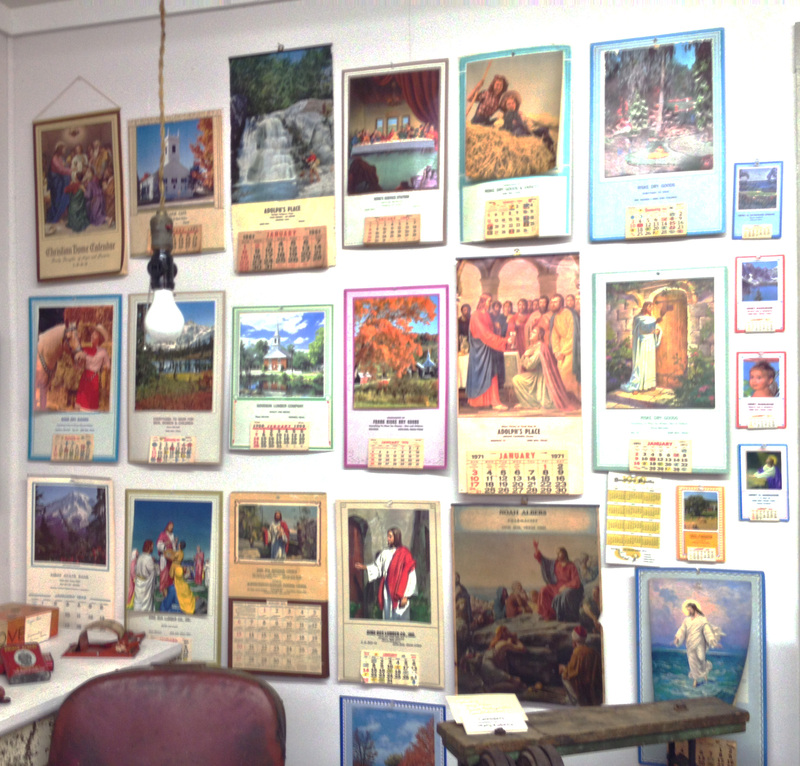 One of Madge’s favorite displays was a wall of vintage promotional calendars from local businesses. Sadly most of these businesses were long gone. 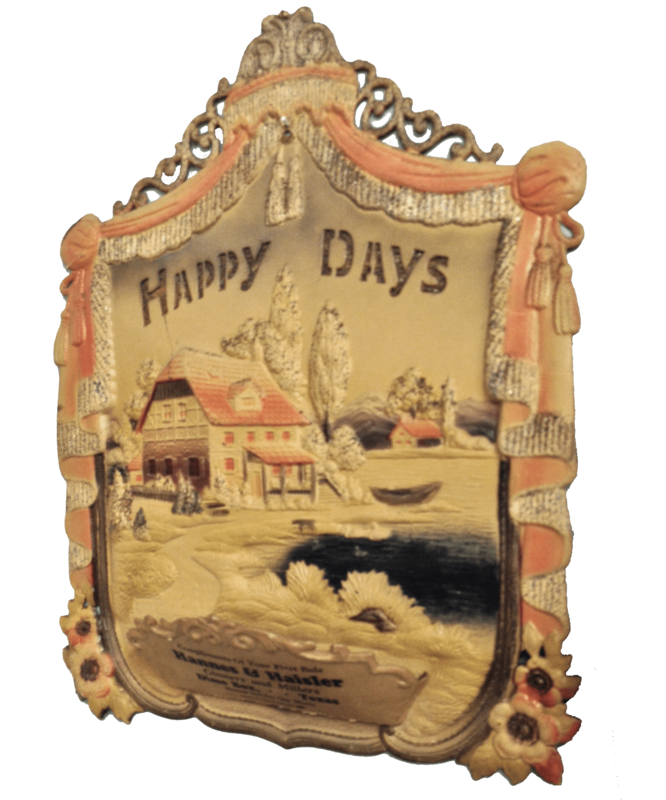 The middle of this promotional piece from the local granary is padded fabric. 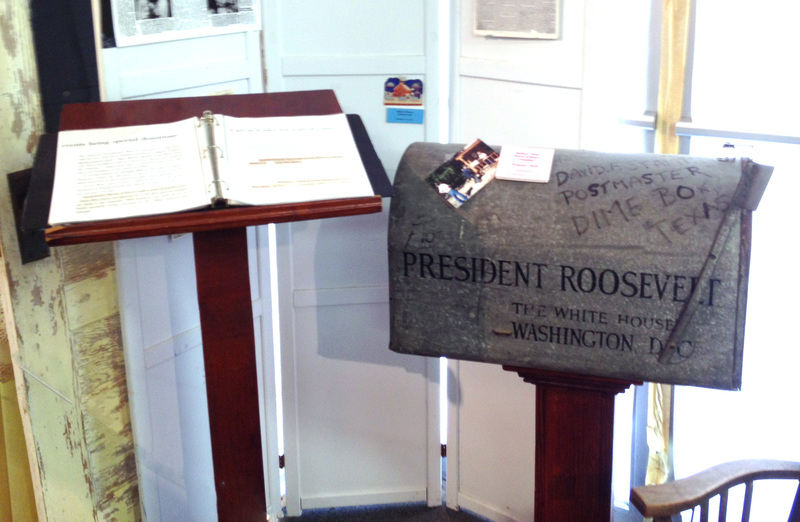 The Dime Box Museum had bound copies of Current Events, a national high school newspaper published from 1902 to 1949. The publisher, American Education Press of Columbus, Ohio, also printed The Weekly Reader, a magazine for younger children that later became Scholastic magazine. This bound edition from 1941 was turned to an October front page urging wartime farmers to produce more food. 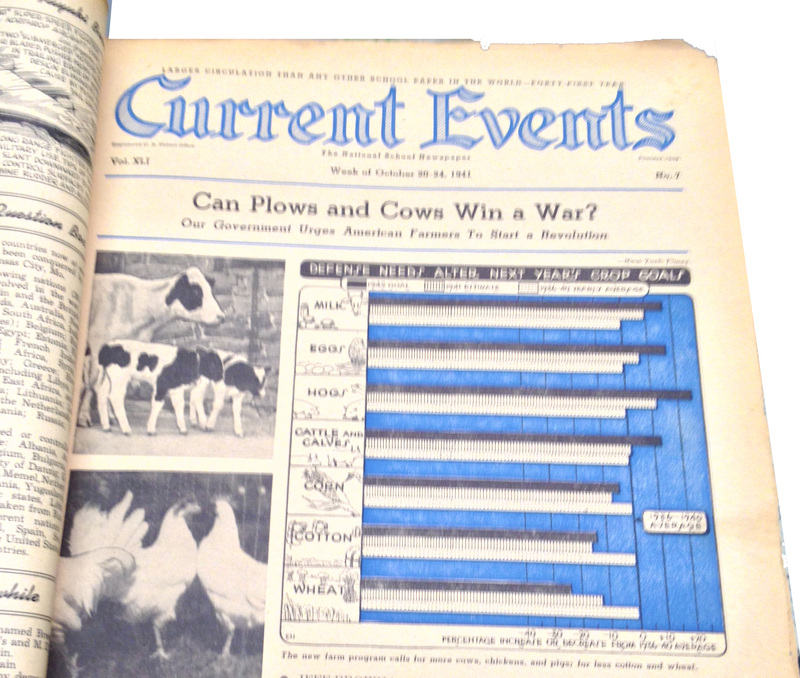 Can Cows and Plows Win A War? 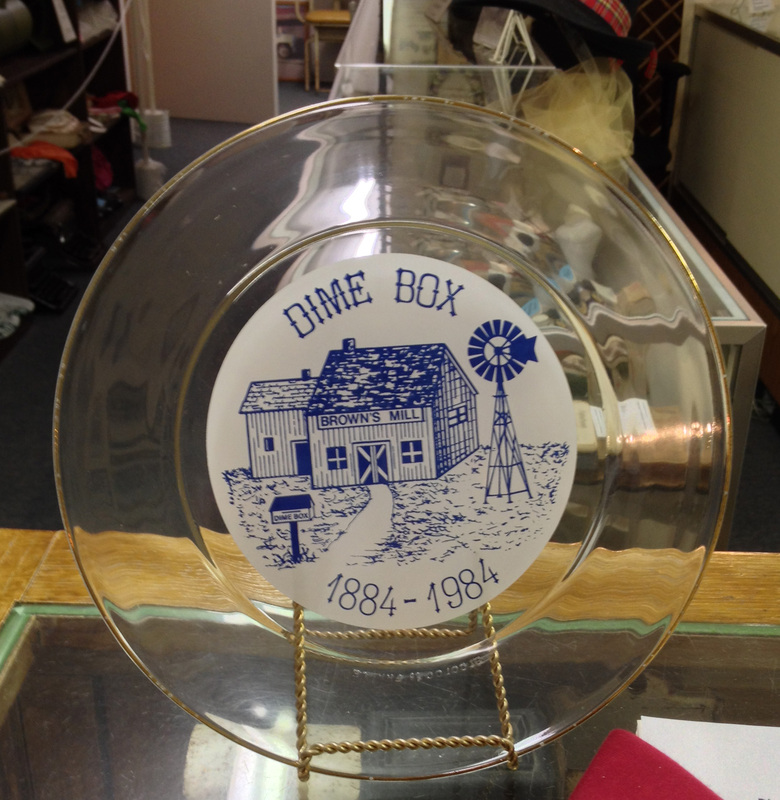 Dime Box did have their 15 minutes of fame in 1944 when it was selected to open the March of Dimes annual campaign. Featured in an article in Life Magazine, the postmaster general was on hand so he could have his picture taken with a mailbox on it’s way to President Roosevelt at the White House. Madge could have stayed for hours, but there was that little detail about getting back to Atlanta. Right before leaving Bonnie asked if Madge if she had seen a church on the way in to town. 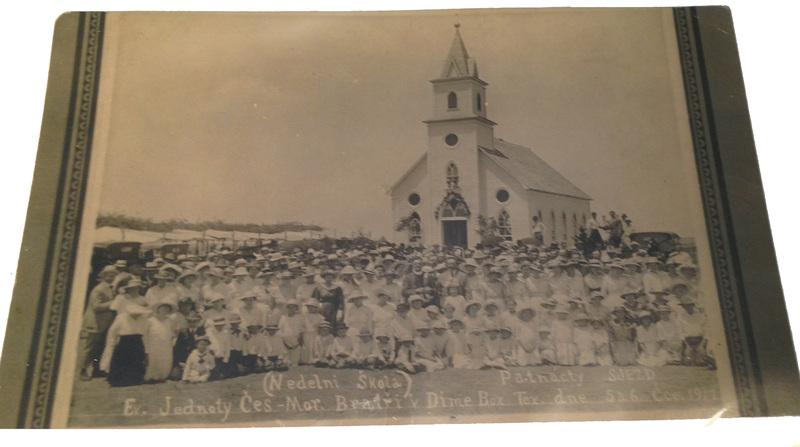 Bonnie opened one of the thick photos albums and there was a 1917 photo of the original Moravian Brethren Church taken shortly before it was destroyed by fire. 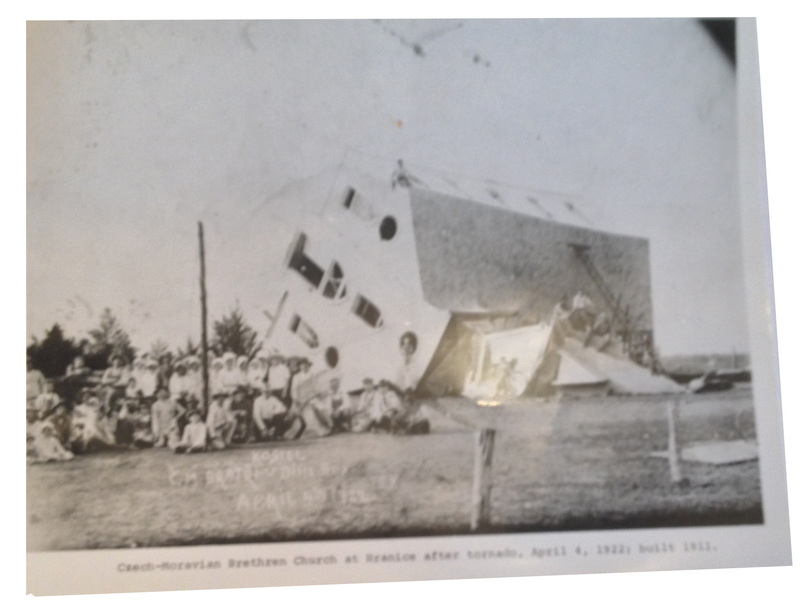 On the next page was a photo of the replacement church after a minor encounter with a tornado in 1922. Well after that, the congregants decided their plot of land had some mighty bad mojo and found a different site for the current building, which happily is still standing. After bidding adieu to Bonnie, Madge stopped to take a closer look at that church. 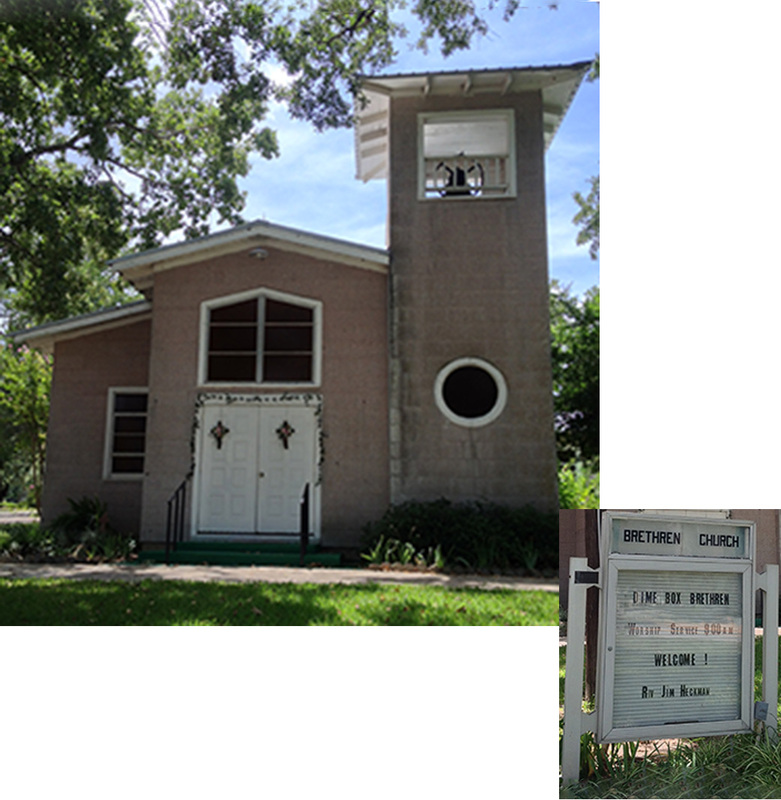 It’s a lovely little building with a charming bell tower. Bonnie suggested looking at the original bell displayed in the yard. Sure enough, there was a large crack in the front and an even bigger surprise in the rear. As Madge turned back on to the main highway, finally on her way to Austin, she was so happy she took the chance and drove down that country road. She also thought about all those other small town museums across the country down other roads whose signs she had seen traveling to some place else more important. Then and there, Madge made a vow make an effort to stop at a few of these amazing time capsules of small town life while they were still around. And the good news? There was another flight only an hour later than the one she missed.